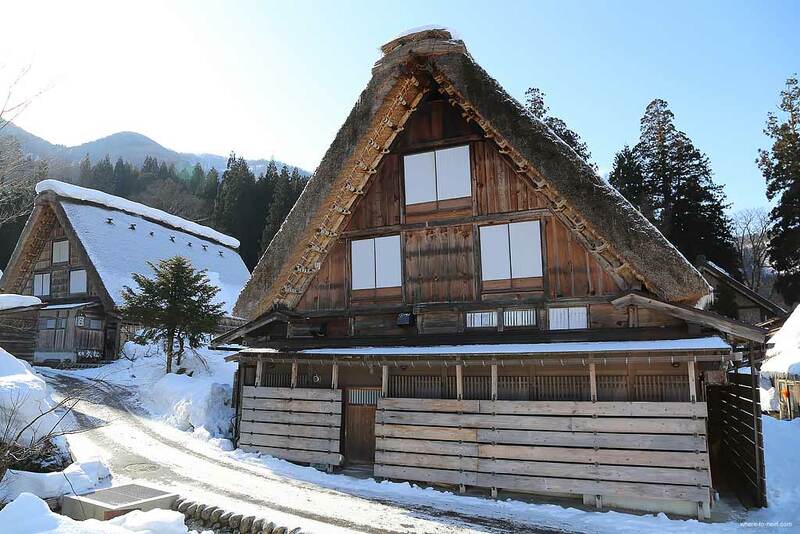 Winter in Japan: Historic mountain retreatswhere to next? 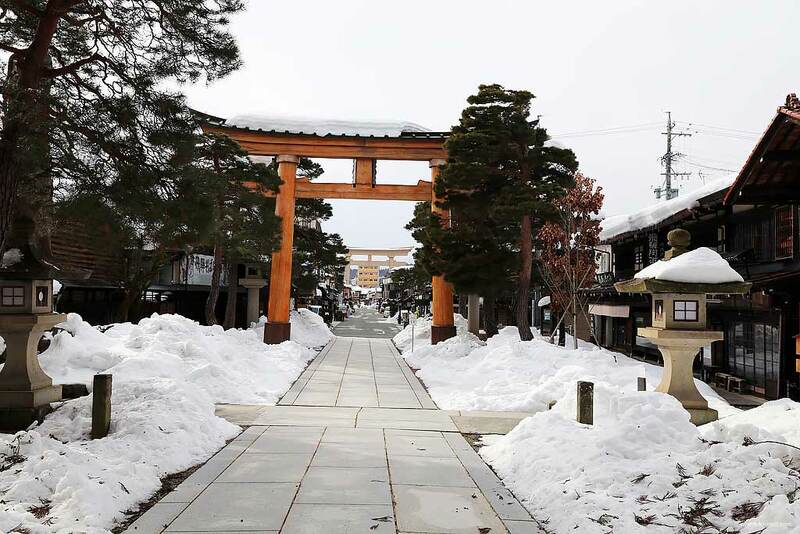 Home / Blog / Winter in Japan: history, culture and snow. 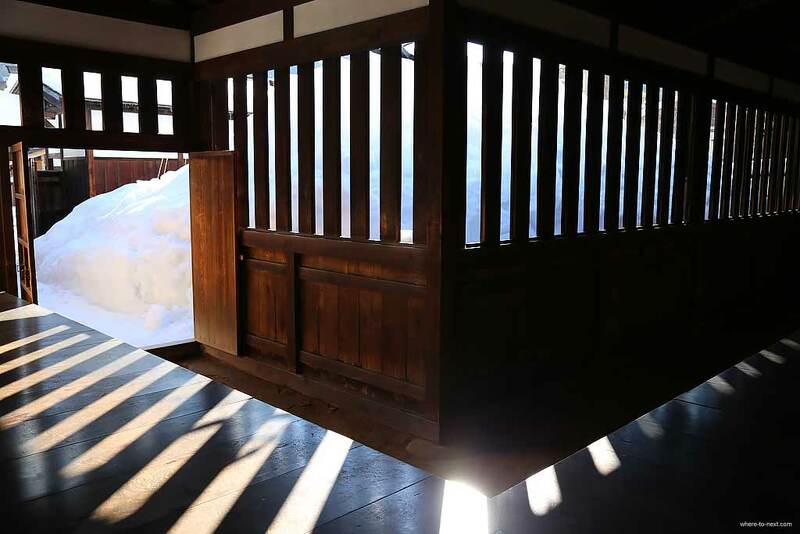 In part two of my Winter in Japan series, I explore the historic Japanese mountain retreats of Takayama, an ancient centre of power during the Edo period, and Shirakawa-Go, the afore-mentioned fairytale village, hidden high in the mountains. Riverside in the centre of historic town of Takayama, the cobbled streets are lined with old private residences – some over 400 years old. You can explore them by rickshaw, or if you’re game (or foolish) like us, head out early in the morning in yukata and sandals to wander the quiet streets before the town wakes up. The morning markets, which open at about 7am each day, are a short stroll from our ryokan. 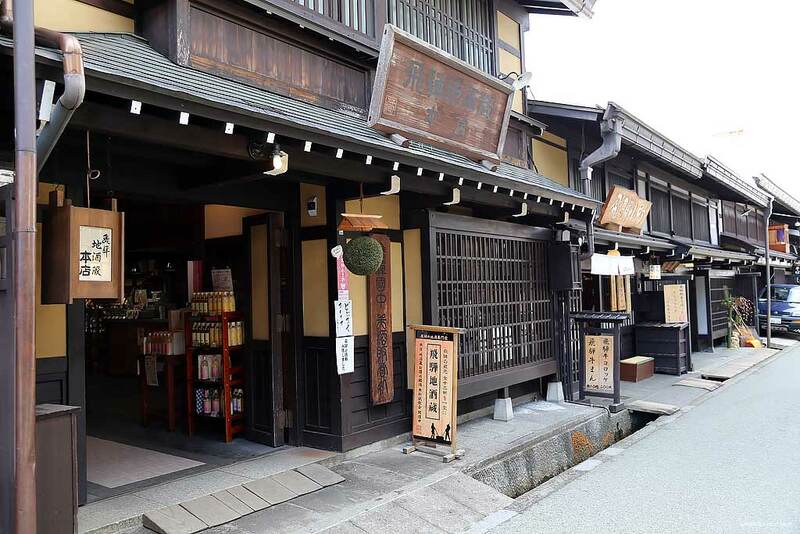 These markets were established in the Edo period – so somewhere between 1603 and 1868, during Shogunate rule, and are located right outside the Shogun Government House. The Government House or Jinya is also well worth exploring. The centre of rule over the Hida region during the Edo period and through the Meiji Reformation, it was still used by local government in some capacity until 1969. 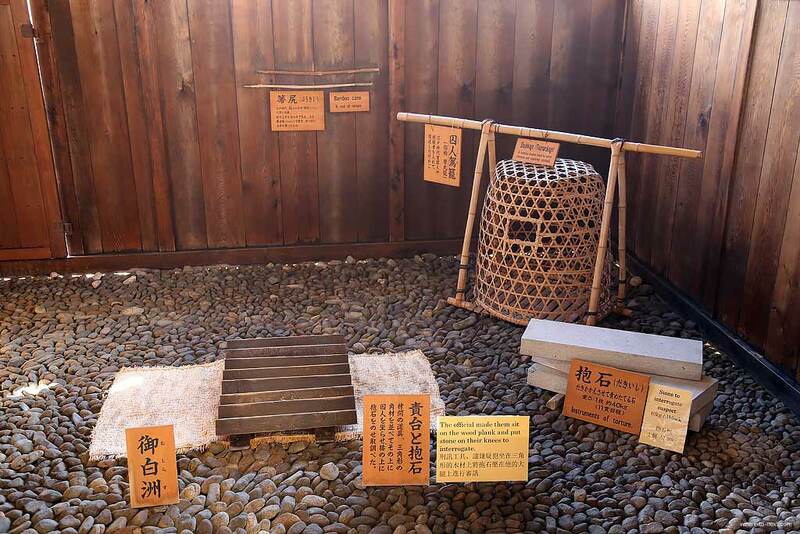 The displays inside show you how life was lived 400-500 years ago, including various Samurai instruments of torture (below) and a selection of haikus written by the ruling lord. The serrated board and stone blocks look particularly horrible. Prisoners were made to kneel on this board while the stone blocks were stacked on their shoulders. 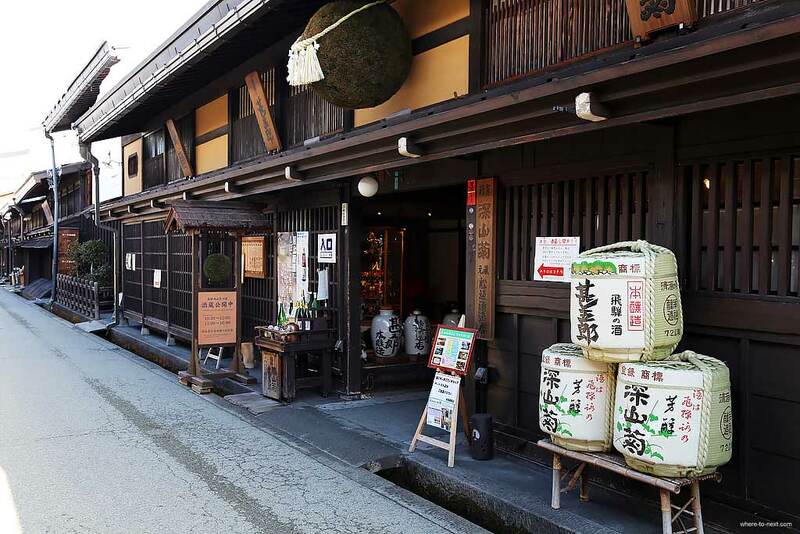 Later in the day the streets wake up and reveal sake breweries and miso factories where you can be taken on a little tour, find out how these delights are made and sample a few in the process. 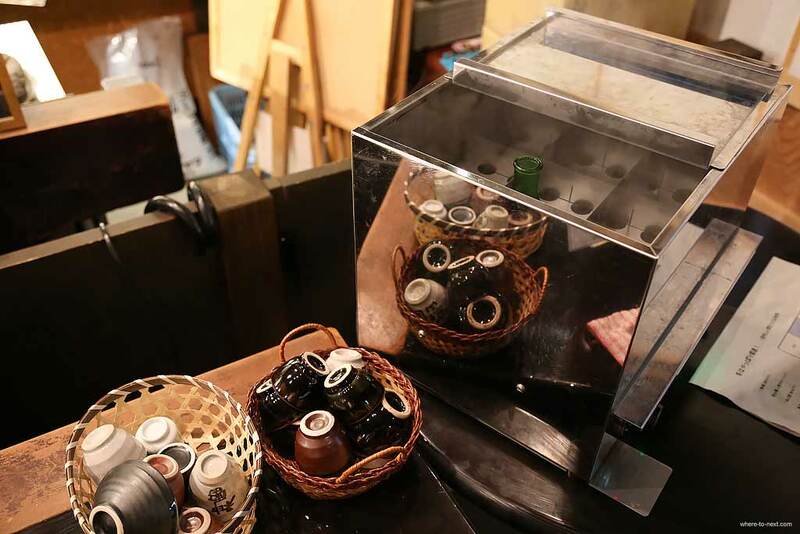 The adjoining sake bars provide steamers in which to warm your sake and a selection of sake glasses to choose from. 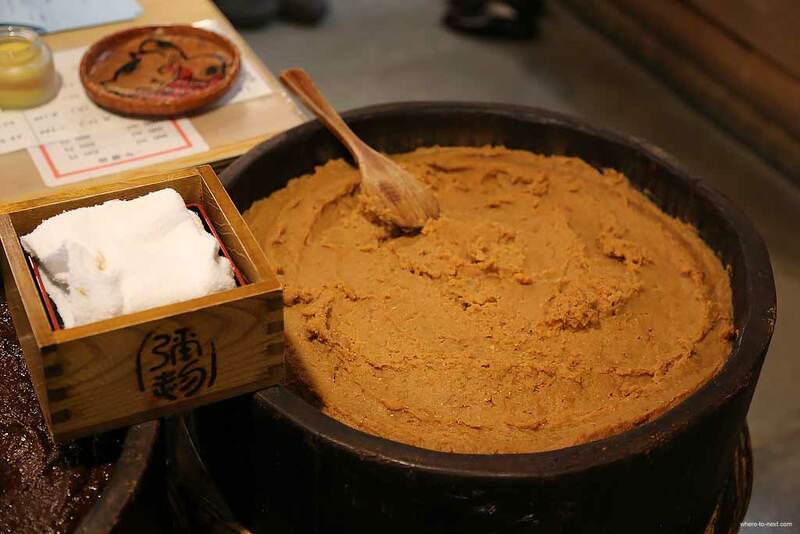 The speciality here is red miso, which has a slightly stronger taste, and when we visit, the factory is in full swing, offering samples and busily packaging and shipping large boxes of miso to unknown destinations. There are also a number of beautiful temples to explore, each with a significant story to tell. This little idol is the protector of children. 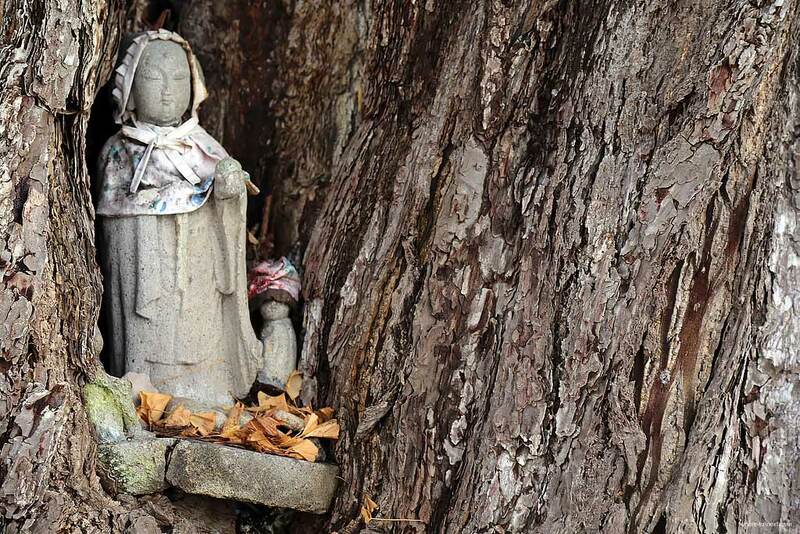 He’s nestled in the trunk of a 1200-year old Gingko tree, a national monument. Legend has it that snow will fall when the leaves of the Gingko fell so it is cherished by local residents as a national monument. 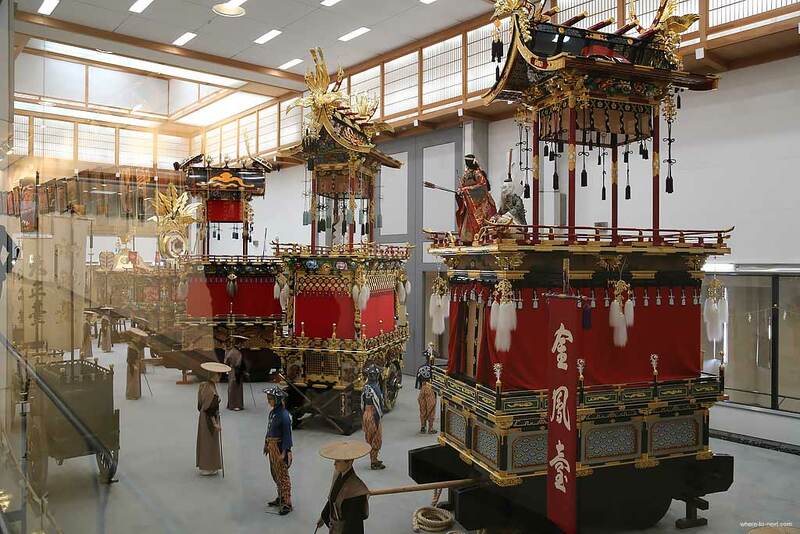 Across town you can visit a permanent display of festival floats at the Takayama Matsui Yatai Kaikan. These incredibly ornate floats go on parade twice a year to celebrate the melting snow and coming of Spring as well as the cooling winds of Autumn. 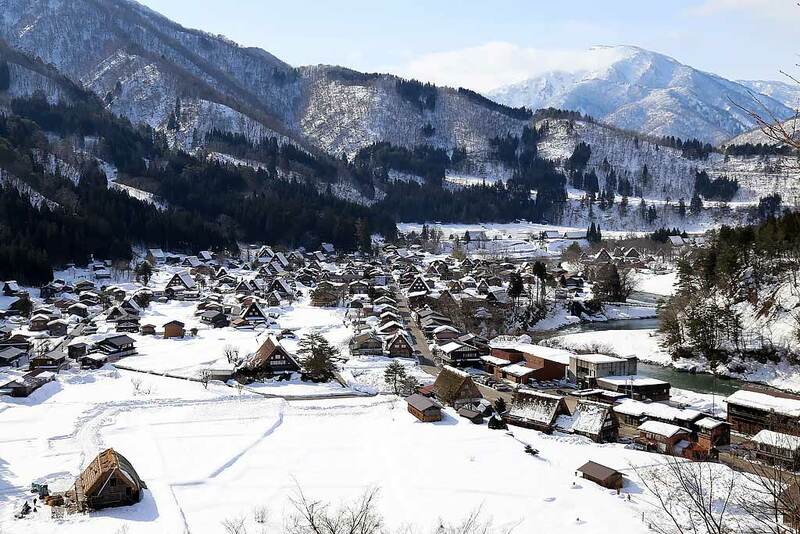 You can get a taste of what life what like in a Hida farming village hundreds of years ago at Hida Folk Village in Takayama (a bit like the Japanese version of Old Sydney Town) but to get the full experience you need to visit the World Heritage site of Shirakawa-Go. This ancient village was literally lost (and preserved) in time, hidden deep in the mountains, it was opened up to the world like a legendary Shangri-La when tunnels were built through the mountains for easier access. 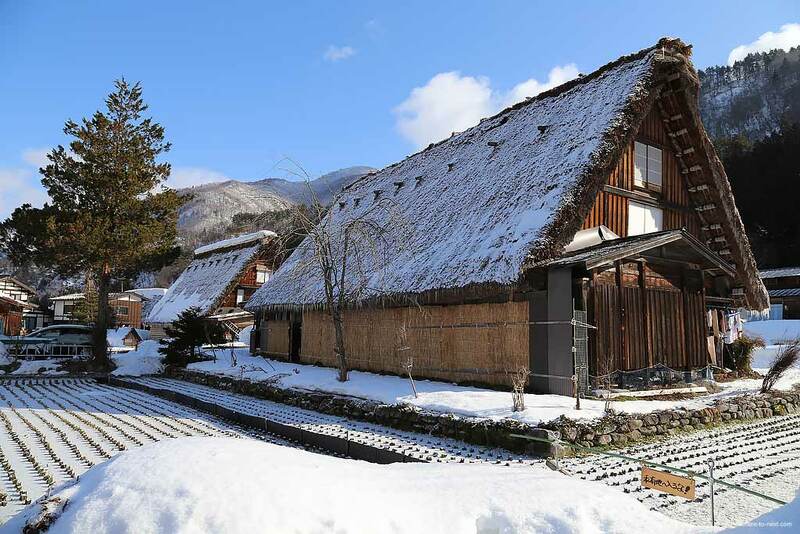 Here you can stay in a traditional ‘gassho-zukuri-style’ thatched guest house. On the night we stayed it was minus six degrees and snowing outside, and although the walls are made of rice paper we are kept toasty warm sitting by the central wood stove in the dining room over dinner and drinking a saké or two to sustain us through the night. In the winter evenings some of these picturesque cottages are lit up in the evening, making the whole little valley look like a Christmas card illustration and they’re just as beautiful to wander through during the day. 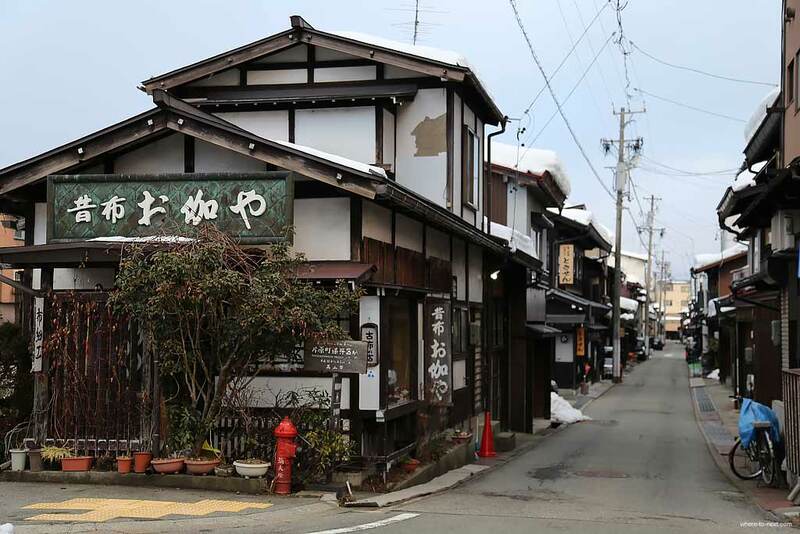 The little village can get quite busy during the day, with day-trippers coming from nearby Takayama, so be sure to book somewhere for lunch before you get carried away exploring the thatched cottages and gift shops. 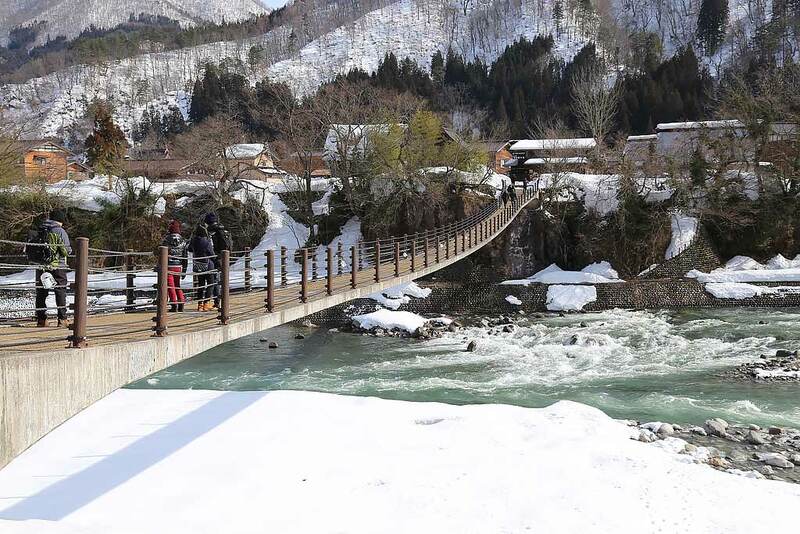 Day trippers are brought by the coach load, and to save congestion on the little streets of Shirakawa-Go, they park across the wide river, and visitors cross into the village over a rope bridge. Traditional Japanese agriculture crops (like rice or buckwheat) are hard to grow this high in the mountains, and while residents kept small fields for their own food it was not enough for trade. The main trade was in silk and nitre. Silkworms were nurtured and silk spun in the large spaces under the thatched roofs. 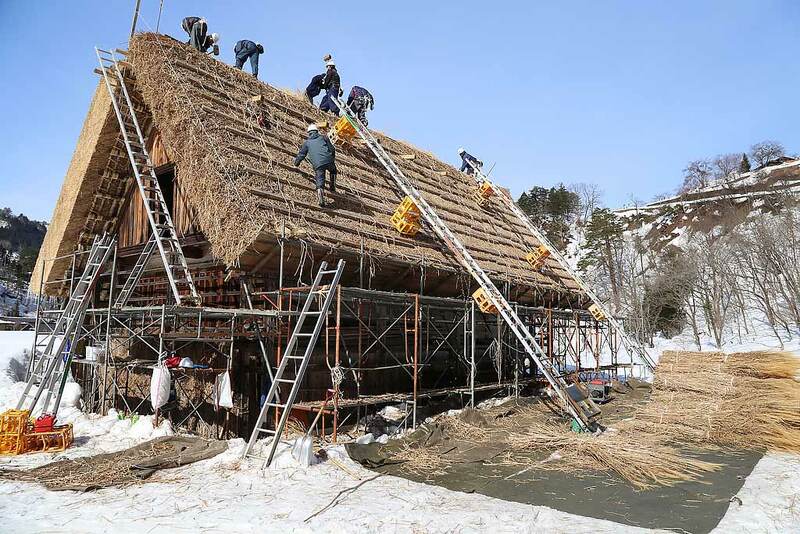 If you’re lucky, you might even catch a team of locals thatching one of the cottages (although why they were doing this mid-winter I’m not too certain). Takayama. Our accommodation in Takayama was in a very luxurious Ryokan called Honjin Hiranoya. My room overlooked the Old Town and two onsen across the street. Kaiseki dinner and breakfast were served in a private dining room with foot well. 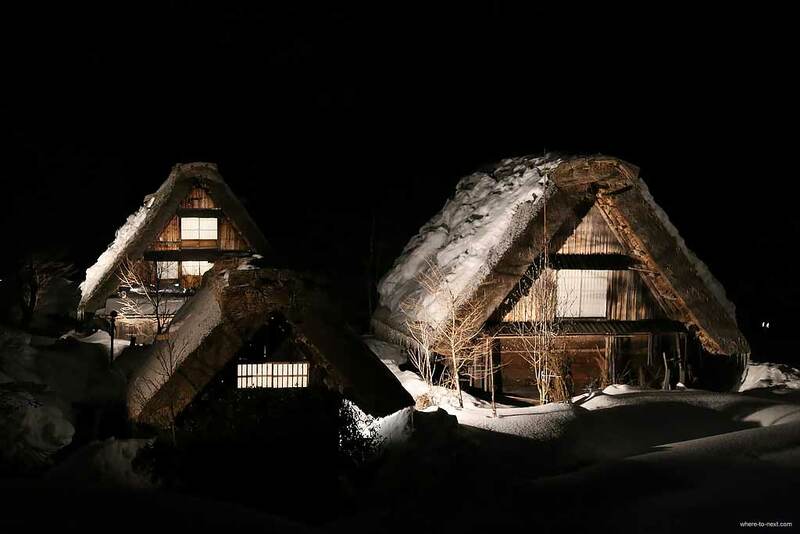 Shirakawa-Go. 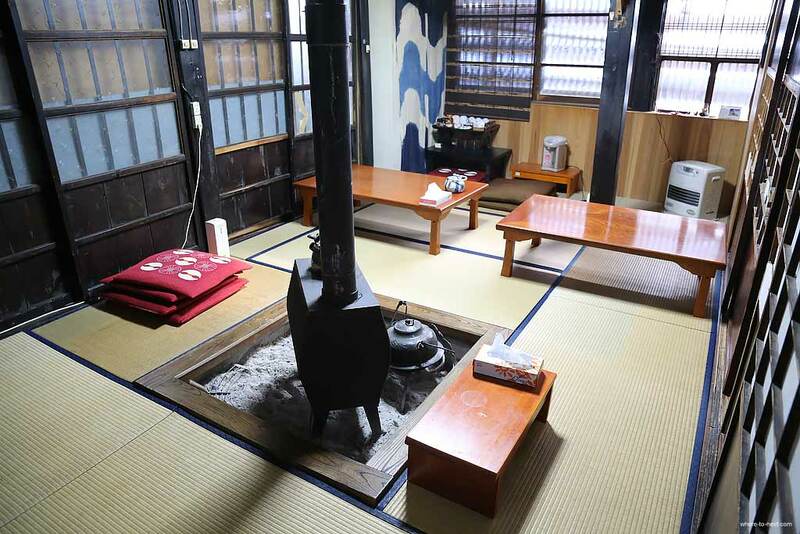 We stayed in a traditional family inn known as a “Minshuku” called Minshuku Furusato. We were treated to a delicious home-cooked Kaiseki dinner and equally enormous breakfast. The writer was a guest of the Japan National Tourism Organisation. 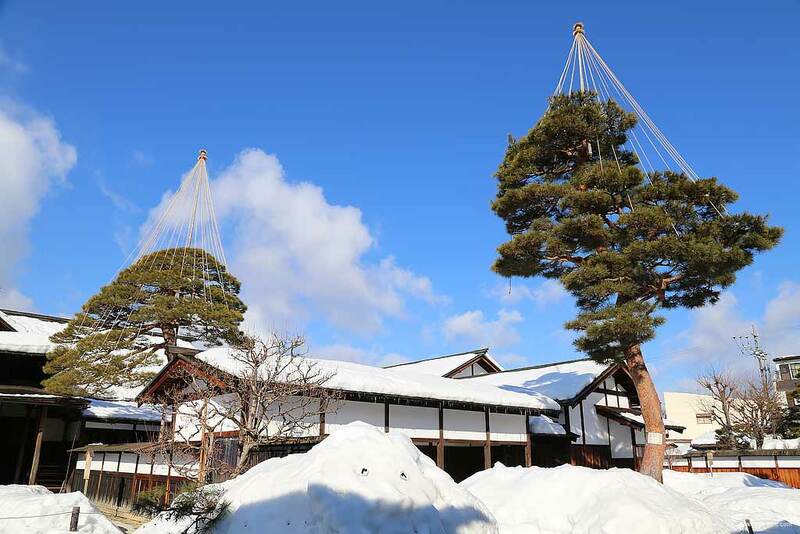 Next Article Japan in Winter – oh yeah, the skiing’s pretty good too. 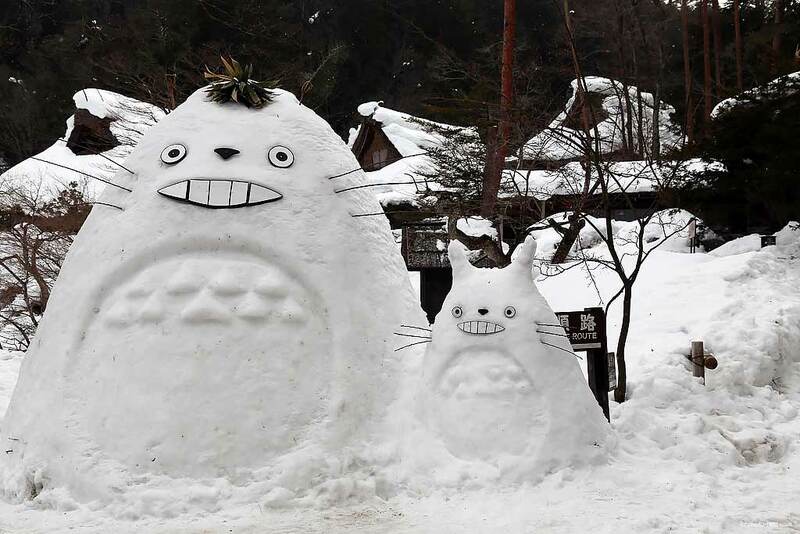 Terrific, I’d only read about people skiing in Japan in winter so learning more of the culture is great as whenever we do go, I’d definitely be keen to explore more than just the snowlfields. Wait till you try the food Seana!